click here Like a front lawn left to go brown and die, the vegetable garden at Patrick Henry High School was a victim of water restrictions imposed because of the drought. That is, until a grant by a local conservation group funded a unique solution to keep it going. The aquaponics system was built mostly after school or during lunch periods by a core group of “around 10 kids” that made up the core of the Aquaponics Club, Pinto said. Those students were from three classes –– environmental science, engineering and marine science. As the project moved along, more students got involved. Ceramics students made decorations for the garden; even a student band called Spa Fish was recruited to play at the kickoff party on Jan. 28. That group effort included the faculty as well. AP environmental science teacher Lara Dickens, who is the student advisor to the Aquaponics Club, organized other faculty to get involved in the program after she first learned of the ECOLIFE grant. 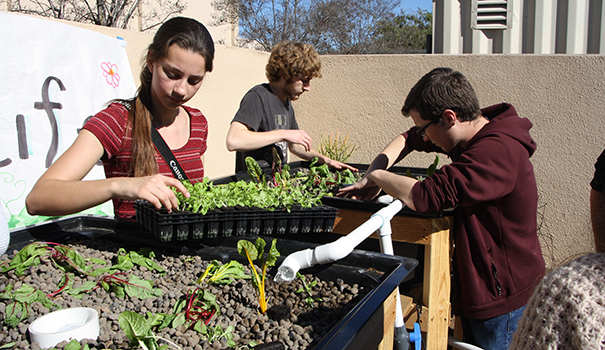 The aquaponics garden is already a part of the curriculum for environmental science, marine biology, engineering and ceramics classes, but even more are planning to use it as a resource now that it is operational. “The art teachers are going to show how to draw plants as if you were observing wildlife, like the old wildlife sketchbooks,” Dickens said. Even the Patriots Pups preschool attached to Patrick Henry plans on bringing its children to visit. Dickens’ excitement about the aquaponics garden is one of the reasons why it was the first of five schools in San Diego County to be awarded a grant to build one, ECOLIFE educational manager Kait Cole said. “What I am looking for is a passionate teacher who wants to spearhead this program,” she said. Other requirements for the grant include access to water and electricity or water and solar; a protected space for the system to be in; and support of school administration. The aquaponics school program is part of ECOLIFE’s overall focus of integrating community health with environmental sustainability using “simple adaptive approaches,” Cole said. In addition to the outdoor system, a smaller, indoor aquaponics system is used at elementary schools. The grants for both programs were funded with $20,000 given by Kiwanis San Diego. In addition to the money, ECOLIFE helps the schools with developing STEM-based curriculum. “These eco-gardens are an educational tool to teach our future farmers the importance of sustainable agriculture and to get them thinking about conservation,” Cole said. For the Patrick Henry students, thinking about cost and logistics also played into the school project. Although the aquaponics system came from ECOLIFE as a kit, Carroll said adjustments needed to be made to it to fit the school’s needs. “We had to cut the PVC pipe, place the beds in advantageous positions where the sun would hit it all the time, position the filter so the fish wouldn’t run into it a lot –– we had all the parts there, but we had to put it together,” he said. The system uses 10 catfish that feed the plants through the waste they produce. The ammonia in their waste goes up to the plants through pipes and bacteria take the ammonia and convert it into nitrogen, which is what the plants use to grow. In return, the plants filter the water for the fish. “It’s a really cool cycle, really efficient,” Pinto said. Marine science teacher Anne Wegmann involved all of her students in the program researching different aquaponics systems and what types of fish and plants would work best together. That research led to the conclusion that catfish were the best choice for the school aquaponics program, though not for the reason you might think. Adria Van Loan-Polselli, who teaches engineering classes at Patrick Henry, said three students from her senior class chose aquaponics as their year-long project. Her students conducted patent searches of the different aquaponics systems. They looked at ebb-and-flow systems, which they eventually chose, as well as Nutrient Film Transfer (NFT) systems. The students laid out how everything was going to work by making blueprints and schematics, first on paper then with a computer using a program called Inventor and another called SolidWorks. The students are also going to print a 3D model using the school’s 3D printers, she said. Through the school’s engineering classes, the aquaponics program will soon expand even further, Van Loan-Poselli said. 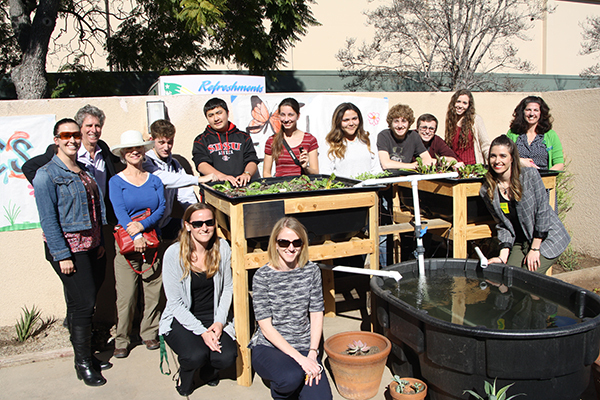 California Career Technical Education (CCTE), which also funds the engineering teaching position at Patrick Henry, offered grant money for the school to buy an NFT aquaponics system. That system will be put in sometime between March and May. “So we will have two full running systems by the end of the year,” she said. Student Olivia Young is planning an expansion of her own. She is taking what she learned about aquaponics and applying it towards her Girl Scout Gold Award project. Her project still needs funding, but she is submitting proposals and hopes to break ground soon. President and founder of the Aquaponics Club, Sabrina Ortega, who is a senior this year, said she hopes that the excitement about the aquaponics garden will carry on for future classes at Patrick Henry. Getting different students together to be involved was one of the reasons she formed the club in the first place.